Air Inlet (NPT): 3/8", 1/4"
We are the leading supplier and exporter of S80/16 A1 Fine Wire Stapler. Wide range of BeA Pneumatic Fine wire stapler 380/16-420. U Tech Fasten Pvt. Ltd.
We stock and offer an assortment of Air Staplers. These staplers allow an easy penetration through the hard materials. Light in weight, our range of air staplers is easy to use. These staplers are procured from the trusted and reliable vendors. Durable in nature, these are highly demanded by our clientele spread across the nation. Our array of Air Staplers, Nailers, Hammers & Scalers is available in various types. We avail these products from the renowned vendors of the industry. Available in various dimension, size, shape, strength, capacity and work expertise, these products are corrosion resistant, durable and are cost-effective. We are also engaged in offering Nailers, Hammers & Scalers. Crown: 1/4", 1" - 1/2", 1" - 5/8"
With the prosperous industry practice, our firm has gained huge appreciation in the market by offering Pneumatic Fine Staplers to our respected customers. 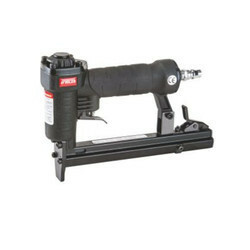 We are indulged in offering our clients a huge range of Upholstery Staplers. These are widely appreciated by our huge number of clients. 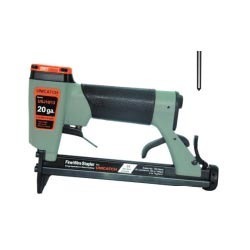 These Upholstery Staplers are available in various specifications given by the clients. • Diameter :- Range 2 mm onwards. • Packing :- The is supplied in coils. - Length- 8 - 3/4"